Day 3 of the 2014 Sierra Challenge took a pause from our usually arduous schedule to allow us some time to reflect and remember our comrade, Pat Hadley, who had died tragically during last year's Challenge. The idea was to pick an easy summit which would allow the maximum participation for a summit memorial to Pat, giving us time to share stories we remembered about her. It so happens that unofficially named Patricia Peak just off Rock Creek Rd would fit the bill. Though it was named after nearby Patricia Lake (whose etymology is not recorded in Peter Browning Place Names of the Sierra Nevada), I thought it fitting to redirect the naming after Pat. The largest contingent of participants ever to sign up for a single peak was scheduled for today - some 35 in all. 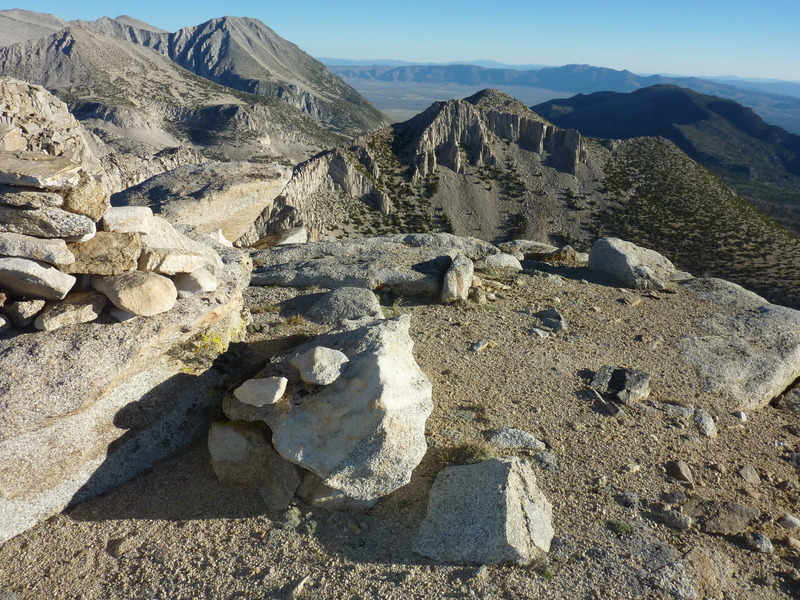 Not everyone managed to make it to the trailhead, nor did all of them make it in time for the memorial, but we still managed more than 20 folks on the summit, a record number usually reserved for large Sierra Club parties. With some starting earlier and some coming later, we had 23 folks at the Hilton Lakes TH near Rock Creek at 6a. Hovering near the rear of this long line of climbers as we started out, I began to consider Pointless Peak just south of Patricia as a bonus peak before heading to Patricia. I had set the memorial to start at 8:30a, giving most folks more than sufficient time to make the 2.5mi trek to the summit. I had previously rejected the idea of climbing Pointless first because I didn't believe I could make both summits before 8:30a, but as we hiked along the trail traversing the east side of the two peaks, I suddenly changed my mind and made a left turn off the trail and into the open wooded area. I hadn't even bothered to tell anyone what I was doing and knew they might wonder. Wonder they did. A few minutes later one of the folks in front of me stopped and asked someone who'd been behind me what happened to me. It was reported that I had left the trail and disappeared. Not exactly sure of the route, my brother Jim and a few other participants left the trail as well. They never found me, and it was only after gaining much elevation towards the summit of Pointless that they realized they were climbing the wrong mountain. They wound up returning to the trail and the trailhead somewhat dejected, failing to reach either summit that day. This is why I try to emphasize that everyone needs to be responsible for familiarizing themselves with the day's route. Turns out I wasn't alone as I soon found Eric had made a similar last-minute choice and the two of us continued together up the East Ridge of Pointless. The route is fairly tame, albeit steep, no more than class 2 if one sticks to the easiest route, moving left when difficulties are encountered. Views open as the trees begin to thin out. There is a nice view off the right to Patricia Lake and Peak. Morgan South and the Little Lakes area opens up to the southeast, behind us. Eric and I stayed very close to the ridgeline, moving from steep class 2 to class 3 and then a short bit of class 4 downclimb as we neared the summit. It took us about an hour and half from the trail to reach the top at 7:30a under sunny skies and wide-open views. A register dating to 2009 was found at the summit, post-dating my previous visit in 2004, the earlier register dating to the 1980s having disappeared. The third page held entries from the 2010 Challenge when three participants climbed Pointless as a bonus with Mono Rock that day. We hung around only long enough to take some photos of the register and the views before continuing on - I knew it would take a good hour to make the class 3 traverse between the two peaks. In either direction the traverse is a good one (I had previously climbed it in the opposite fashion), both Eric and I finding the scrambling enjoyable. None of the route is terribly exposed or scary, but there is plenty of fun to be had on the mile-long traverse (the class 3 is found in the narrower middle third of the traverse). We made it to the lower south summit of Patricia by 8:30a, but did not quite make the highpoint on time, arriving a few minutes late. There was a good-sized crowd already at the summit but more were still on the way so we postponed the memorial for another 30min. While Jonathan satisfied his restlessness by building a very tall (and probably somewhat dangerous) cairn on the summit block, we opened the gift Laura Molnar had left here a week or two earlier - a 12-pack of Fat Tire beer, the brand chosen to commemorate Pat who had been a national mountain biking champion. Normally I don't enjoy drinking beers on the summit, but this one was both cold and refreshingly good. Not everyone in our summit party was a beer drinker, so there was enough to go around with sharing. Most of the summit crowd had arrived by 9a when we began the memorial. It was a simple affair, opened with one of the ladies reading the poem that Laura had written for Pat. I'm not normally an emotional guy, but I was choked up and tearing by the time she had finished. It really hit me how much I miss Pat, how I spent much of the past year thinking about her just about every day. I had some trouble reading a few pages I had written, knowing I would be unable to speak without notes, not realizing how much trouble I would have even with them. Others shared stories, humorous or touching or both, from our shared experiences with her the previous two years. She had touched so many lives in so many fields - school where she taught, Boys XC as a coach for 20yrs, mountain biking, mountaineering and others. Her spirit was so charged that she could inspire anyone and everyone around her. It was impossible to be in a bad mood whe she was around. We'll continue to love and miss you, Pat. The memorial concluded after about half an hour when everyone had said what they'd come to say. I felt sad, but better afterwards, having felt a healing presence with so many other like-minded folks there to share it with. Pat would have wanted us to keep climbing, so climb we did. Tom, Luke and JD planned a more ambitious afternoon, heading to Stanford and Morgan North while I was heading to officially unnamed Hilton Peak, a much easier endeavor. The four of us descended the indistinct, class 3 NW Ridge of Patricia using different variations, regrouping just above the nearest of the Hilton Creek Lakes below. As a class 3 route it seemed safe enough without serious exposure, but the rock was somewhat loose and I couldn't really recommend it as a good scramble. We headed west across the trail, down an ugly boulder field and eventually to the south shore of Lake 10,353ft. From there we followed the watercourse upstream towards Mt. Stanford, easy cross-country at first, but eventually becoming talus and boulders. Before the greenery had given out I left the others to start uphill towards Hilton Peak on its SE side. The rounded, class 2 ridge I followed was a collection of granite blocks and talus piled up to the summit and not particularly enjoyable. There are cliffs at the base of the SE side that can be avoided on the left, or west side. It may be possible to climb through these cliffs at class 3, but I didn't explore that possibility. I reached the summit shortly before noon, with good views in all directions. Looking west, I spent some time trying to spot the others on their way up to Stanford, but I saw no movement and heard no voices - they were a stealthy crew, it seemed. To the north rose the 13,000-foot Morgan North, blocking part of the view to Lake Crowley behind it. To the northeast could be seen Davis Lake and Red Mtn, with the Hilton Creek Lakes and Wheeler Crest to the east. Finding no register, I left one of the PVC ones Jonathan had constructed, this one with a nice picture of Pat on the inside cover. After a brief stay of about 15min I headed back down, following the same SE Ridge I had used for the ascent. I stayed on the ridge longer, intending to take it all the way down, only to discover the cliffs at the base of the mountain that I hadn't noticed earlier. Rather than try to find a workable route down through the cliffs, I backtracked to the west side where I had ascended and took the more certain, if longer route back down. Out of the boulder fields and talus, I was happy to find a use trail in the woods leading back to Lake 10,353ft. Rather than take the regular trail back once at the lake, I decided to follow a cross-country route instead. I had plenty of time and nowhere in particular to get to, so I just sort of lost myself in thought as I explored the off-trail rambling down to the lowest of the Hilton Creek Lakes and from there up and over the long, rounded ridge that forms the saddle between Red Mtn and Patricia Peak. I passed over one trail or another at several locations, but kept off the beaten path while I enjoyed the easy travel in the forest understory. I eventually reconnected with the trail again above the Pine Grove Campground and followed it for the last several miles back to the TH where I arrived before 3:30p. The day had been an enjoyable one, reflective too, especially the last four hours I had spent in the Wilderness solitude. Thank you Pat for sharing your life with so many of us. We will always remember you. We are women of the mountains, she and I.
I tread worn paths; pack weighs heavy across broad shoulders. My head bobs, gaze shifts to step and check my route. Lifts my arms in embrace and play. Green hairs of algae awash and waving in the current. I stand atop the ridge and summit, looking down, looking back. Trace my history to the horizon. Plot my slow advance along a future road. She rides the clouds, pushes hard as they erupt away from heated hills. Her joyful roar rumbles and echoes across basins. Her laughter: the playful shower of rain on green meadows. Her flushed cheeks: the glow of sunset. She runs the streambeds, splashes diamonds along the shoreline. Twirls as she leaps the lakes and races the breeze. And she soars once more. She inspired me almost as much as you have, my friend. I'm glad that, in a small way, I could be with you all that day. Much love to you, my dear friend. Can't find the text for this trip.